Our website may be used without entering personal information. Different rules may apply to certain services on our site, however, and are explained separately below. We collect personal information from you (e.g. 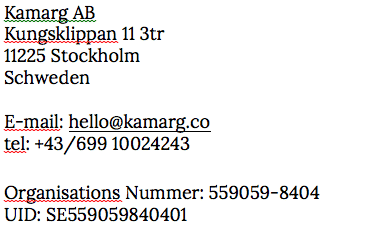 name, address, email address, telephone number, etc.) in accordance with the provisions of European data protection statutes. Information is considered personal if it can be associated exclusively to a specific natural person. The legal framework for data protection may be found in the General Data Protection Regulation (GDPR). The provisions below serve to provide information as to the manner, extent and purpose for collecting, using and processing personal information by the provider. We offer you the opportunity to sign up for our website. The information entered when signing up (your address, e-mail, phone number) , as shown in the registration for is collected and stored solely for use by our website. When signing up for our website, we also store your IP address and the date and time you registered. This serves to protect us in the event a third party improperly and without your knowledge makes use of your data to sign up for our site. None of this information is transferred to third parties. Nor is any of this information matched to any information that may be collected by other components of our website. If, while completing your order to pay with credit card, you decide to use Stripe as an online payment service, your contact details will be sent to Stripe during the order process. Stripe is a service from Stripe, 185 Berry Street, Suite 550, San Francisco, CA 94107, USA.. PayPal assumes the function of an online payment service and trustee, and offers buyer protection services. The personal data transmitted to Stripe usually includes your first name, last name, address, telephone number, IP address, e-mail address, or other data required to process your order, such as the quantity of articles ordered, the article number, invoice amount, percentage taxes and invoice details, etc.